PULLMAN, Wash. – A WSU research team is building smart sensors that they plan to use to assess the health of aging bridges. Led by Pizhong Qiao, a professor in WSU’s Department of Civil and Environmental Engineering, the researchers received a grant from the U.S. Department of Transportation through the Pacific Northwest Transportation Consortium to develop small sensors that will be affixed to bridges. The sensors will send ultrasonic waves through concrete to identify cracks or degraded material, without the need to drill into the concrete. “The smart sensing technology can be used to identify damage in bridges, monitor safety conditions, assist bridge maintenance decision making, and help the DOT perform forensic studies on premature failures,” he said. 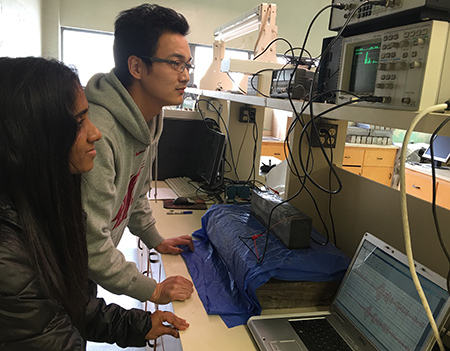 WSU doctoral students Ayumi Kalpana Manawadu and Zhidong Zhou (l-r) run tests on concrete using smart sensors. Much of the U.S. infrastructure is in poor shape. The American Society of Civil Engineers gives aging bridges nationwide a C+ grade and the overall infrastructure a D+. Many of the approximately 200,000 concrete bridges were built in the 1960s and 1970s with an average design life of 50 years. In recent years, there have been a few high-profile bridge failures. Workers conduct regular bridge inspections using a variety of assessment techniques, said Qiao. They sometimes drill holes to take samples or manually hit bridge sections to do vibration studies. Different types of damage, such as cracks, fatigue, corrosion or impact damage, require different assessment techniques. Physical inspections are time consuming and expensive, he said, and don’t necessarily give a complete picture of what’s happening on a bridge. Furthermore, the aging bridges are not monitored continuously. Bridge materials are also complicated. Concrete changes over time in a variety of ways, sometimes developing cracks or material degradation. Different sections of the bridge experience very different stresses, and a variety of climates also have varying effects on materials. In recent years, researchers have been trying to develop nondestructive techniques that can monitor the bridges continuously and in real-time. Many of these techniques, however, are expensive, inaccurate, or difficult to implement. “Right now, there is no effective technology,” he said. The initial $80,000 DOT grant through the grant will allow Qiao’s team develop a nondestructive sensor that can sit directly on a bridge. The sensor is made of piezoelectric material (PZT), a type of crystal that allows mechanical energy, such as squeezing or stretching, to be converted to electrical energy. The sensor sends out waves into the concrete and draws a picture for the researchers that might indicate holes, damage, or weakness in the material. Using PZT means that Qiao’s sensors can be small, lightweight, and inexpensive, he said. The technology has been used in studies to monitor and assess damage in concrete, but until now, it has been embedded within the concrete. Qiao’s team will be affixing the sensors directly on the surface of the concrete. They hope that the information they gather from the sensors will help them establish a database to better understand which materials and bridge sections are most vulnerable and how cracks and damage most commonly develop. They are developing and testing their sensor in a laboratory with the idea of eventually testing it on real bridges.